Dolores Huerta, born in New Mexico in 1930, was and is a strong Latina and is indeed a hero to agricultural workers everywhere. Yet, there are few picture books about her; if at all, she is generally depicted as secondary to César Chávez, together with whom she founded the National Farm Workers Association. In creating this excellent portrait focusing on Huerta’s efforts to empower migrant workers, first-time picture book author Warren remedies this shortcoming. In Warren’s engaging, spare and accessible prose, complemented by Casilla’s vibrant watercolor-and-pastel illustrations, the workers are real people—young and elderly, afraid, worried, outraged and resolute. On each double-page spread, young readers will learn about the farm worker struggles in the 1960s and discover the reasons Huerta is a teacher, a detective, a friend, a warrior, an organizer, a storyteller, a peacemaker, a mother, a woman, a fortune-teller, and a hunter; and, coming full circle, a teacher. I use the word “discover” because Warren, demonstrating the best practices of teaching, shows rather than tells. Dolores is a detective. She follows the kids home. She asks the moms why their kids are hungry and sick. She asks the dads why their children don’t have shoes. The parents say their bosses don’t pay them enough money for good food or new clothes or a visit to the doctor. These parents work hard. They pick grapes all morning. They pick grapes all afternoon. They pick grapes until night, but they are paid too little and shoes cost too much. 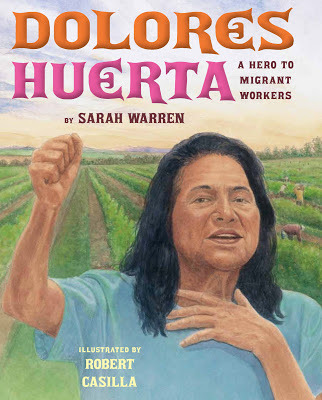 With a helpful annotated timeline and “learn more” page as backmatter, Dolores Huerta: A Hero to Migrant Workers is a celebration of Dolores Huerta’s life and leadership, and is highly recommended. I am so thankful for this blog. I have learned so much and I can't wait to share your teachings! I'm so happy you think our book is a valuable resource. I offer a free version in Spanish on my website. Please share it with anyone who might like it.